R-47 (hull number 819) is a Project 12411 missile boat designed for destruction of enemy warships, transport and assult vessels, terrorist groups in the sea and in the bases; protection of ships and vessels from surface and air attacks. Missile boat R-47 (serial number 206) was laid down at Srednenevsky Shipyard on June 2, 1983; put afloat on August 21, 1986; and commissioned on February 13, 1987. 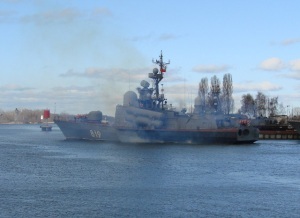 Since 1986, the boat had a name of Tambovsky Komsomolets, and was renamed into R-47 on February 15, 1992.